"Valuable . . . like Michelle] Alexander's The New Jim Crow." "Susan Burton is a national treasure . . . her life story is testimony to the human capacity for resilience and recovery . . . Becoming Ms. Burton is] a stunning memoir." Susan Burton's world changed in an instant when her five-year-old son was killed by a van driving down their street. Consumed by grief and without access to professional help, Susan self-medicated, becoming addicted first to cocaine, then crack. As a resident of South Los Angeles, a black community under siege in the War on Drugs, it was but a matter of time before Susan was arrested. She cycled in and out of prison for over fifteen years; never was she offered therapy or treatment for addiction. On her own, she eventually found a private drug rehabilitation facility. Once clean, Susan dedicated her life to supporting women facing similar struggles. Her organization, A New Way of Life, operates five safe homes in Los Angeles that supply a lifeline to hundreds of formerly incarcerated women and their children--setting them on the track to education and employment rather than returns to prison. 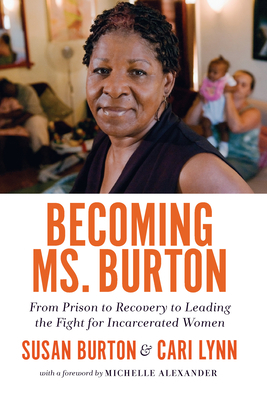 Becoming Ms. Burton not only humanizes the deleterious impact of mass incarceration, it also points the way to the kind of structural and policy changes that will offer formerly incarcerated people the possibility of a life of meaning and dignity. Susan Burton is the founder and executive director of A New Way of Life, a nonprofit that provides sober housing and other support to formerly incarcerated women. Nationally known as an advocate for restoring basic civil and human rights to those who have served time, Burton was a winner of AARP's prestigious Purpose Prize and has been a Starbucks "Upstander," a CNN Top 10 Hero, and a Soros Justice Fellow. She lives in Los Angeles. Cari Lynn is a journalist and the author of five books of nonfiction, including Leg the Spread and The Whistleblower (with Kathryn Bolkovac). Lynn has written for O, The Oprah Magazine; Health; the Chicago Tribune; and Deadline Hollywood. She lives in Los Angeles. Michelle Alexander is the author of the bestselling The New Jim Crow: Mass Incarceration in the Age of Colorblindness (The New Press). She lives in Ohio.